Einstein reputedly said, “Learning is experience. Everything else is just information.” These sage words have never been more pertinent. New technologies are creating opportunities to make immersive learning more experiential, creating the opportunity to “transport” people into an environment or situation where they are enveloped and engaged at greater depth than previously possible. And the technology is poised to make the leap into workplace learning, as factors conspire to bridge the gap between possibility and practicality. More deeply immersive learning is now possible, and it’s bringing with it a powerful tool for delivering more memorable and meaningful learning experiences. Up until now, creating an immersive experience within workplace e-learning might have meant leveraging approaches such as storytelling to place the learner as the actor within a story, or encouraging real-time decision-making and experiencing the consequences of their choices. For those with the resources, simulations offer greater immersion by providing experiences that closely emulate a real-world situation and enable practice physically within it, in real time. Indeed, there’s evidence to suggest that experiences gained during a simulation can be committed to memory as if they were real. But there are some limitations with these approaches. E-learning doesn’t have the same experience of embodiment as a simulation; meanwhile, a simulation is often highly complex and therefore comes at a higher price tag. Such costs may be suitable for certain mission-critical skills practice (such as flying a Dreamliner), but for the majority of work skills, the cost makes them non-viable for many organizations. Simulators are also major pieces of hardware, not something that sits easily with the increasingly agile, personalized requirements of today’s global workforce. New technologies are creating opportunities to engage people at greater depth than previously possible. However, there is now a new generation of immersive technologies, including interactive 360-degree video, virtual reality (VR), augmented reality (AR), mixed reality (MR) and, a little further down the line, haptics, which hold exciting possibilities for bringing deeper immersive learning into the workplace. Let’s take a closer look at some of the most talked about technologies. VR (computer-generated recreation or 360-degree video of a real-life situation) builds an environment that simulates a real experience without the risk, difficulty and cost. It also enables trainees to make decisions safely and to learn from their mistakes. And it allows for practice. The most often cited uses are simulators that allow learners to effectively “road test” machinery such as cranes and forklift trucks. Any job that’s potentially dangerous would see great benefit in training that includes VR. AR (computer-generated interactive enhancements layered on top of existing reality) is all about giving people information when they need it, so it actually takes away the need to memorize everything. A lot of workplace mistakes are caused by people not being able to remember exactly what they learned in their training, so AR has a tremendous amount to offer as a performance support tool in reducing errors at work. AR can be incredibly simple at the point of delivery. Emerging now is volumetric film. This relies on light-field captured footage that produces 3D images of the surroundings. What this means is that within a VR experience, the “flat” nature of the video will disappear, and you will be able to move around the actors within the space. Early examples include films shown at this year’s Tribeca VR festival, “Hallelujah” and “Blackout.” This will increase user agency in an immersive experience, and later – with the addition of haptic feedback introducing the sensations of touch, heat and enhanced spatial awareness – simulations will become as close to reality as you can get. This has real application for learning in vital areas such as the emergency services, military and mechanics. Great examples are firefighting training and surgical procedures for medical learners. Immersing people in a life-like situation using interactive VR or AR works equally well with soft skills. Customer service or crisis management are great examples where staff can be placed in positions of potential conflict or tension, where they are able to make decisions about what might pose a risk. By tackling scenarios in an interactive environment, the learner develops the skills to resolve issues in an appropriate way. This really is learning by doing, in context. But immersive technologies can do even more than this. They can help organizations choose the right job applicants. By putting candidates through their paces at the recruitment stage, they can gain the best possible insight as to their skills and suitability. And it gives the potential new joiners a chance to “try out” the job in advance. It takes some of the guess work out of the selection process and increases the chances of both employer and applicant making the right decisions, saving a whole lot of time and money. We’ve reached an exciting moment in the rise of immersive learning technologies as several factors converge to change the landscape. First, VR has evolved from a PC-based technology to a mobile one. This means that an immersive experience is now achievable simply using the same technology we carry around in our pockets – our smartphones. And, thanks to web-based VR, it eliminates the need for apps to be installed on personal devices. Add to this the emergence of affordable VR headsets like Google Cardboard and other hands-free equivalents, the investment needed to provide the experience is much more accessible to companies. Further, the technologies needed to create the experience itself are also more affordable with more consumer 360-degree video cameras arriving on the market all the time. So, the stage is set for immersive learning to enter the workplace learning ecosystem. But there’s still a chasm to cross. In his book, “Crossing the Chasm,” Geoffrey A. Moore identified the conditions that enable a disruptive technology to move from innovation to mainstream adoption. He observed that the mainstream market (the early majority) isn’t focused on whether a technology is new; it’s about whether it’s better. So, what’s the evidence that immersion is better for learning? A recent study sought to compare mobile VR learning against two other learning methods. 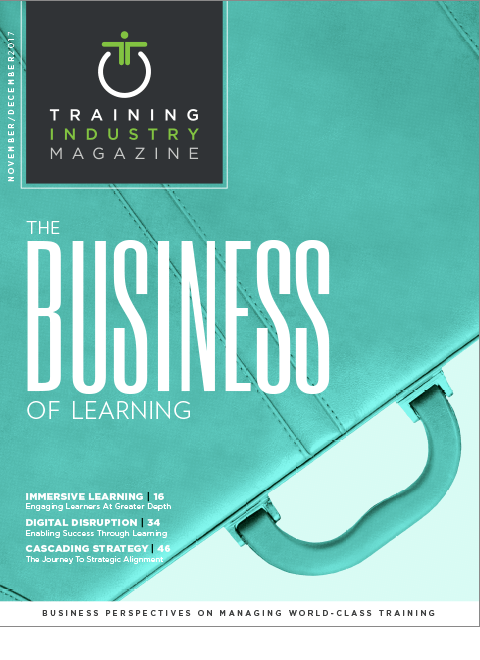 In the VR case, 100 percent of learners said they could apply the learning and 90 percent said they would feel valued if their employer offered VR. Compared to other learning methods, mobile VR delivered greater learning satisfaction, was significantly more enjoyable and easier to concentrate on. And even more than this, learners who encountered the VR experience scored an average of 94.5 percent when tested on the learning objectives, compared to the average scores of 87 percent for a text document. More research is being carried out all the time, amounting to a growing body of evidence that suggests immersive technologies can make learning more memorable and meaningful. The mainstream market isn’t focused on whether technology is new, but on whether it’s better. If futurist Gerd Leonhard is right in his prediction that we’ll see more change in the next 20 years than we’ve experienced in the last 300, then those who are responding now will have a head start. These changes will revolutionize the jobs we do and the way we work, and technology will be driving many of these changes. Immersive learning is only going to get bigger. Kate Pasterfield is head of innovation at Sponge UK and a double award-winning learning technologies designer.